Why do this? Many people, including me, complain about the size of the stock turn signals, from how far they stick out to how big and bulky they are, both front and back. Most go the aftermarket route but these are usually much less bright than any stock turn signal. I opted to go to Buells because they have shorter stalk, are slightly less tall, and much less bulky than originals and are pretty cool looking with their smoke clear outer lens and amber inner lens. It's been noted that these are actually brighter than the stock GS turn signals by other GS riders. They are also very cheap-$7/each new at Harley-Davidson/Buell dealer and are usually in stock. 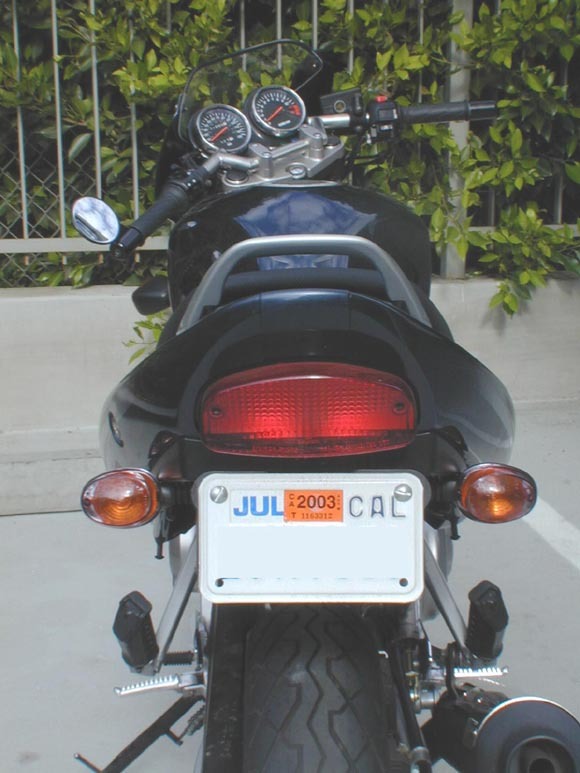 All newer Buells use the same turn signals; the part numbers are not model dependent. You could adapt these instructions (making necessary adjustments) to any stock turn signal. Also, you may want to disconnect battery to do this work, I chose not to. 1. With bike on centerstand (or otherwise keep bike vertical) find a suitable place on the rear fender to put the new turn signals. This installation coincided with my wanting to redo my fenderectomy even further so the higher the better. I also wanted to minimize how far they would stick out. I chose to put them in the small recess just in front of where the tool kit goes in the rear inner fender; several inches back, an inch up and about 1/2" in from stock location. 2. Remove nut from back of existing turn signal. Cut wires leaving about a 4" pigtail and pull signal out. You have to splice the new signals into the existing wires since the new signals only have ~6" pigtail on them. They come with male bullet conectors so you'll have to buy some 16-14 size female bullet connectors for existing wires. 3. Drill a 3/8" hole. Be careful about pushing on the bike; make sure the bike is stable while you drill. The Buell signal has a 10mm threaded hollow shaft where the wires run and a 4mm locator pin just back from that used to keep signal horizontal. The 3/8" hole was a super snug fit for the 10mm shaft, and combined with the locking washer and nut on back side I opted to just cut the plastic locator pin off (quite easy with a sharp knife). I drilled a pilot hole first to aid in making the holes same on both sides. Make sure you drill the other side in same location. 4. Slide new signal in hole. Slide locking washer and nut over wires, onto shaft and tighten down, making sure the signal is horizontal. Note: The bulbs that come with the Buell turn signals are different wattage than stock GS and will make the signal blink faster than before. I've been told this will not harm anything-leave them as is at your own risk. All it takes is a Tridon 552 generic relay flasher, I believe. Available at any auto parts store. About $2-$3. You may want to save the rear stock signals to swap the rears to the front as this is a good way to reduce the width up front. 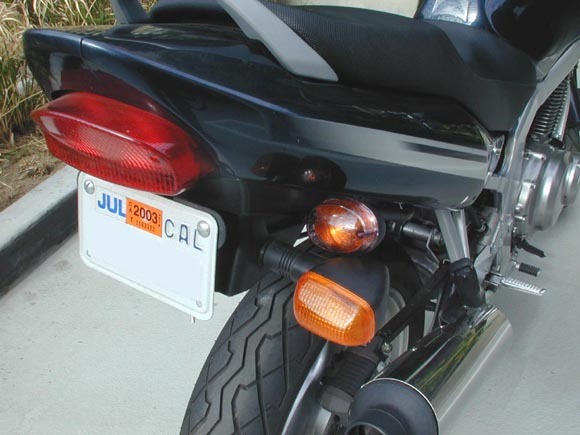 or check the Buell front install page. 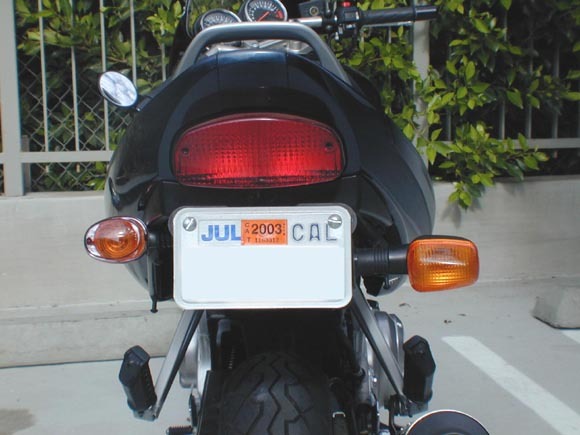 Some that have done the Buell turn signal swap have had a problem where the blinker turns on steady without blinking. It was discovered that it had to do with not having enough draw across the flasher unit. By installing a new generic flasher, available from Wal-Mart for about $2, (It's just a round cylinder with two connectors, it's hidden behind the plastic anyway) solved the problem, or install the same one as mentioned above. Special thanks to Pam G for calling my attention to this mod in an archived GSTwin.com post.